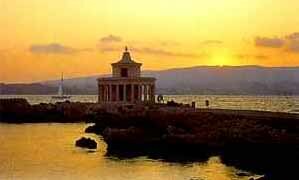 Kefalonia, Cefalonia, Ionian Islands, Hotels and Travel in Greece. Is the largest of the lonian islands. Green rocks plunge suddenly into the deep blue waters. Picturesque villages and small beautiful towns highlighted by old mansions and "humble" farmhouses; a little further over, the ruins of some ancient city. Kefalonia has been justly called the island of contrasts: Roman, Venetian, and Byzantine ruins, side by side with famous beaches. The capital Argostoli is where the sea pours into spectacular swallow-holes and disappears endlessly into subterranean tunnels forming a rare geological phenomenon. The water reappears at Lake Melissani, an incredible semi-underground lake of clear turquoise and indigo water. Nearby is the Drogarati cave, a large stalagmitic cavern of rare beauty. To the north is the small village of Fiskardo, and its pretty harbour, that has escaped the earthquakes and retains the old style buildings. History of the island: The history of Kefallonia is long and goes back for thousands of years. The island has been inhabited since the Neolithic times, as it is evident by findings discovered at the cave of Drakena, near the village of Poros. Some people believe that Odysseus' (Ulysses') palace was actually in Kefallonia, instead of the much smaller Ithaca that is next to it. In general, Kefallonia's history is similar to that of the other Eptanisa, as the Ionian Islands are called. In Classical times, Kefallonia was allied with Athens. After the fall of Greece, the island was conquered by Romans. There are remains of a beautiful Roman villa, in the village of Skala, with a very nicely preserved mosaic floor. After the decline of the Greek and Roman empires and for many centuries, the island fell prey to the pirates. Kefallonia came under the control of the Italians during the 12th century, who governed it from 1185 to 1478. Venice, France, Turkey (very briefly) and England were in succession the conquerors of Kefallonia until 1864. In 1864, as a result of many years of social unrest and struggle by the inhabitans, Kefallonia was united with Greece. The wonderful Cultural museum in Argostoli, located under the Korgialleneia Library, has invaluable exhibits from these periods. It is a place you must visit and will be a fun and educational experience for the whole family. Another museum to visit is the Archeological museum, where one can see findings from excavations at the island. Kefallonia has a rich tradition in the arts, music and literature. Fortunate enough to avoid the Ottoman rule, for any extended period of time, the island was not isolated from the cultural developments taking place in Europe. There are numerous libraries at the island that are worth visiting, as they have rare first editions on exhibit. Magnificent Views: Kefallonia is the largest of the Ionian islands (it covers an area of 781 km2 and has a coastline of 254 km). Its land is dominated by the Ainos mountain. In the North and West, it has a ragged and beautiful coastline while in the South and East there are large and sandy beaches, whith crystal clear waters. Kefallonia has mild meditteranean weather conditions, that make it wonderful to visit for most of the year. The capital of the island is the town of Argostoli (pop. 7500). It is a lively place, especially in the summer months, with much of the action taking place around its main square (panoramic view, will take you to external site). Argostoli is a modern town that offers many entertainment and shopping opportunities, while still maintaining its charm. One of my favorite things to do is taking an early morning walk on the waterfront (panoramic view, will take you to external site). Argostoli, as well as all the other towns and villages of the island, were completely rebuilt after the devastating earthquake that struck in 1953. The only area that was spared from the earthquake was Fiskardo and for this reason it retains the charm of the old architecture. The second largest town of Kefallonia is Lixouri, on the Pali peninsula. The port of Sami, on the eastern side of the isle, is the main entry point, due to the fact that it is opposite the Peloponnese peninsula. The port of the capital Argostoli, on the western side, is the most secure port of the Ionian Islands and a perfect place to practice your sailing. The island is very mountainous, with its highest peak, Mount Ainos, reaching 1628 m (5100 ft), which is also the highest of all the Ionian Islands, and is covered by a rare black pine forest. There are still some wild horses roaming its slopes (unfortunately their numbers are declining) and the area is an official National Park of Greece. On the lower elevations the hills are covered with vineyards, that produce the famous Robolla wine. The island has four large gulfs that are safe ports for boats. In the north there is the Gulf of Myrtos, in the east that of Sami, in the south that of Lourda, and in the west that of Argostoli. In the area of the port of Sami, there are interesting geological phenomena, like the Cave of Drongarati, with stalagmites, and the cave of Melissani, with a subterranean lake. The caves are open to the public and if you are lucky you may catch an orchestra performance in Drongarati, which has fantastic acoustics. Another favorite visiting spot is Karavomylos, where there are springs of sea water that has traveled underground from the area of Katavothres, near Argostoli, 35 km away. Kefallonia is one of the few places where the rare turtle Kareta-Kareta lays its eggs. Visitor Information: You can read a great book about Kefallonia and its people during WWII, by Louis De Bernieres, titled "Captain Corelli's Mandolin" in the UK and "Corelli's Mandolin" in the USA. It is the perfect book to take along when you travel to the island. Kefallonia is fairly easy to get to. The island is aproximately 20 nautical miles from the port of Killini, on the coast of the Peloponnese and 50 nautical miles from the major port of Patra, that connects Greece and Italy. Ferryboats connect the island with Killini (1 hr 30 min) and with Patra (3 hrs 30 min) all year long. In addition there are ferries that connect Kefallonia with the islands of Zakynthos, Ithaca and Lefkada. You can also reach Kefallonia by ferryboat from the Italian ports of Brindisi, Ancona and Bari. There are Olympic Airways flights to and from Athens (45 min) and the nearby island of Zakynthos (20 min). During the summer months you can fly directly to Kefallonia, with charter flights from many European cities. Getting around the island requires some form of transportation. If renting a car or a moped is something you choose not to do, the public bus system KTEL is an easy and inexpensive way to not only see most of the island, but to meet the locals too. So why visit Kefallonia? For starters, you will have a chance to relax, if this is what you want, or you can enjoy the fun and excitement of watersports (parasailing, water-skiing, windsurfing, scuba etc.). If you like mountain biking, you will not be disappointed. Nightlife provides for quiet dining by the sea, pubs for music and drinking, Greek music clubs, as well as nightclubs with the latest in European dance music. The island is large enough and has enough to see, so that you will not get bored after three days. It combines beautiful beaches with mountainous and green terrain. It has a very good infrastructure. The airport is newly renovated, the roads are in good condition and for those with medical problems, the hospitals of Argostoli and Lixouri are capable to handle all medical emergencies. And to top it all off, it is cheaper to visit and less crowded than other more popular destinations! Holidays in Greece, Hotels in Greece, Greek Islands Hotels.